As the light of morning slipped across the South Dakota prairie and a horde of Supervillains invaded Red Cloud Indian School, the Superheroes sprang into action! With a fervor of fortitude and a razzle dazzle of wisdom, they were ready for the dangerous and cantankerous challenges ahead—the challenges of Adventure Day: Capture the Superhero Spirit, River Ramble, the Tree of Terrible Traps, Iktomi’s Web, the Cave of Shadows, and finally – the Boogie Oogie Oogie Bridge. Go get ’em! Nine months earlier, Michael Mallon, 3rd grade teacher, stuffed his superhero costume into the closet (next to his clown costume) in his cozy cottage home on the Pine Ridge Indian Reservation. In a new land, he didn’t quite understand how to be a superhero…yet. 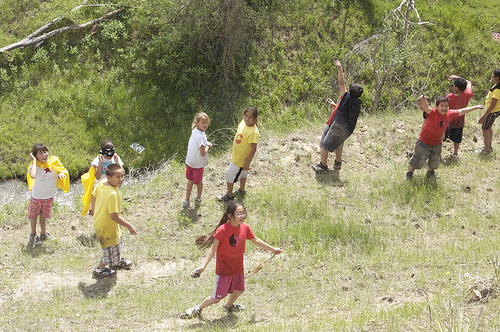 First, he had to learn from his students, from the elders, and from community members about Lakota ways. And what they taught him—about Lakota values, animals, natural elements, and adventure—would turn into a yearlong curriculum that laid the foundation for Superhero Training Academy in its fourth year. The school year began with the study of the Lakota values from Joseph Marshall’s book The Lakota Way. Students studied bravery, fortitude, perseverance, wisdom, truth, respect, compassion, love, generosity, humility, honor, and sacrifice. These values were studied in stories from Native cultures as well as student interviews of their elders’ lives. Several months later, heroes would embody these values when they created their own superhero character. But first, a non-fiction research report on animals with.biome study, clay creation of their animals, changing name tags to become their animals, and a compare/contrast essay about the abilities and vulnerabilities of their animals as like or unlike themselves. After this extensive study of the “Animal Inside“, the students placed their animals into the Lakota value that would most fit them: wisdom, compassion, fortitude, or humility. Under the guidance of four Lakota values and the Medicine Wheel, the young heroes continued their character formation with a choice of a literary character to study. They exercised incredible inferencing reading comprehension skills to find the character traits that defined the character under investigation. Again, they found the strongest value that character embodied through their actions and expanded their language of what that value means. Smashing all character studies together, the students transformed themselves into a superhero character with a defining symbol. Heroes focused all their energies on the particular value that defined them most (now called the Four Core Forces), and they dug, searched, and uncovered more and more of their abilities until they remembered their all natural, incredibly unique, out of control amazing, Superhero Light, which they represented in their symbols on their get ups. Next, heroes painted an image onto a “Superhero Shield” that represented their lights. Heroes were blasted with all manner of negative forces: doom, gloom, discouragement, even flapdoodle poppycock. Their resolve fierce and their wits about them, they protected themselves with their shields and formed havens of safety by huddling together. Back in the creative laboratory of percolating possibilities, heroes began their “Superhero Licenses” through the study of twelve different archetypes. Gadzooks! It’s not just one core force inside of a person…each person is all of them. After Superheroes found their unique “Spectrum of Perspective” through the Superhero Licenses, they learned where to look to find their shadow. The true test of the Superhero: to champion shadows within. A Lakota elder, Basil Braveheart, came in to speak to the heroes about “owning your shadow.” His eloquence and ability to simplify this enigmatic truth led the heroes to find their own shadows and create shadowscapes. The heroes shared their shadows so they would not transform into fears. Then they changed their shadows into trophies. Now the Superheroes were ready for their final challenge: Adventure Day: the Quest for the Superhero Spirit.